View over the Kerumutan Peat Swamp Forest important habitat for the critically-endangered Sumatran tiger. Greenpeace, together with representatives from the National Parliament and the Indonesian National Police, are in Sumatra to bear witness to the huge destruction of Indonesias natural peatland forest. 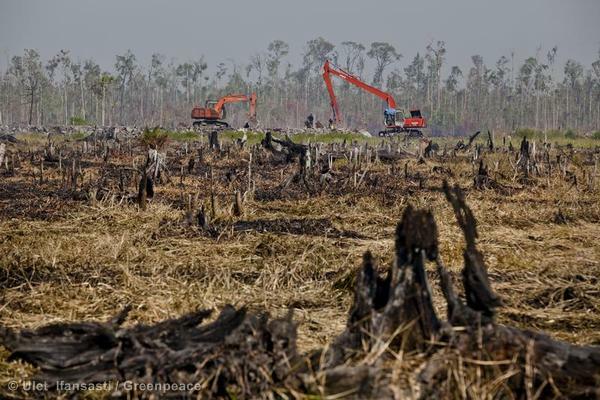 Deforestation is a key source of Indonesias greenhouse gas emissions. 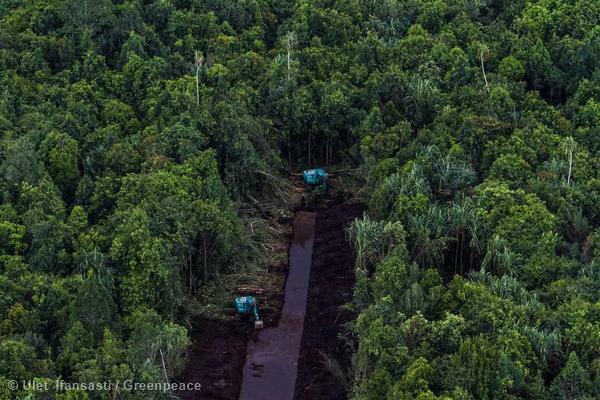 Greenpeace is demanding the Indonesian government to fully review the existing logging concessions and to institute full protection of peatland and natural forests. For years, this is known as a smoky, hazy time of year in Sumatra. And each year its getting worse.It’s the dry season, and hundreds of thousands of hectares of Indonesian peatland fires burn for months. Those fires are a direct result of decades of forest and peatland destruction. Peat is partially decayed, dead vegetation, which has accumulated over thousands of years. It is typically saturated with water and therefore virtually impossible to set alight. But when peatlands are cleared and drained to make way for plantations, like they are for palm oil and pulp and paper, carbon-rich peat becomes tinder dry and vulnerable to fires. Canal construction through peatland forest inside a PT Riau Andalan Pulp & Paper (PT RAPP) pulpwood concession. PT RAPP is a subsidiary of APRIL, the pulp & paper division of the RGE Group. On 28 January 2014, APRIL announced that it intends to continue to use rainforest logs until at least 2020. 1. They are great carbon stocks, but can also havoc the climate. 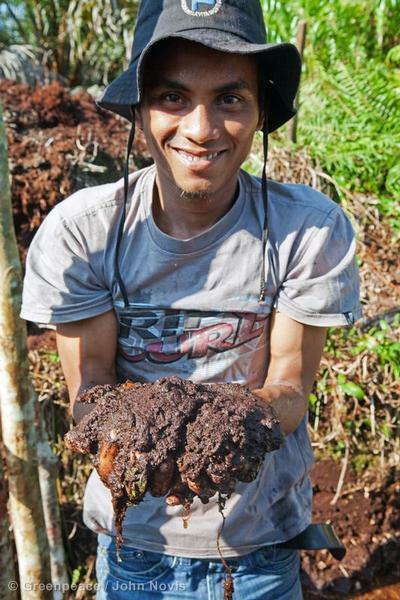 Indonesias peat stores a crazy amount of carbon up to 60 billion metric tons, which makes it a virtual carbon bomb. Globally, the amount of carbon held in tropical peat is around 88.6 billion metric tons. If all this carbon were released into the atmosphere as carbon dioxide it would the same as burning all proven oil reserves from Saudi Arabia, Venezuela, Canada, Russia, and the United States combined. 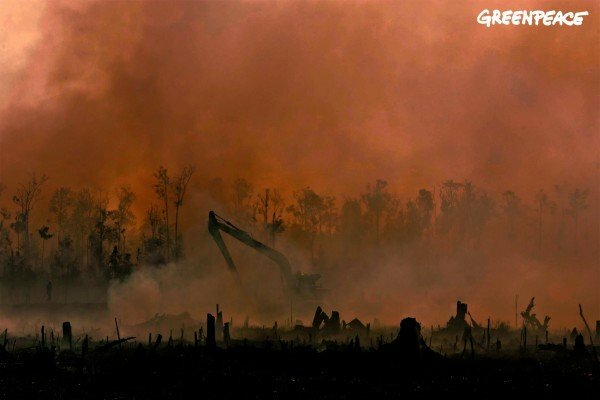 Peat fires and the release of carbon from peat and forests are the main reason Indonesia is the third largest greenhouse gas emitting country, after the US and China. 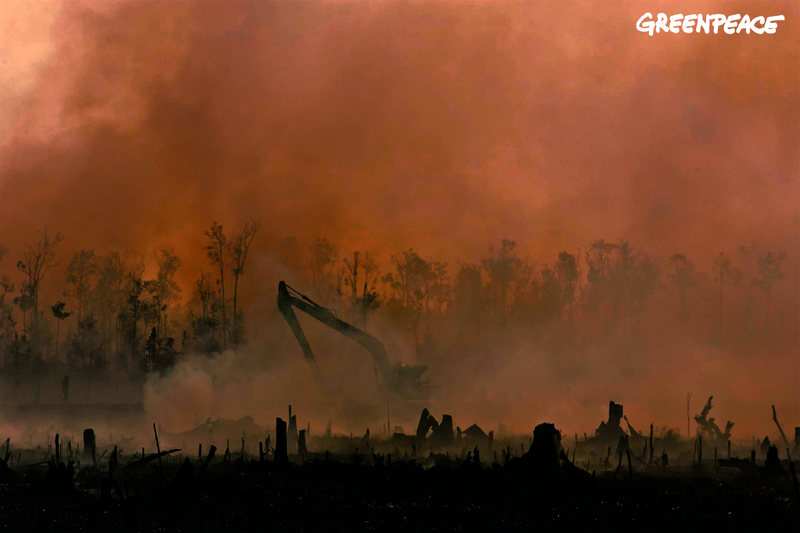 Smoke from smoldering fires obscures an excavator digging a peatland drainage canal at an oil palm plantation in Riau, Sumatra. 2. Public health. A study in 2012 attributed an average of 110,000 deaths a year to forest/peat fires in Southeast Asia. They add untold amounts of air pollution to metropolises across the region. 3. Hotspots. 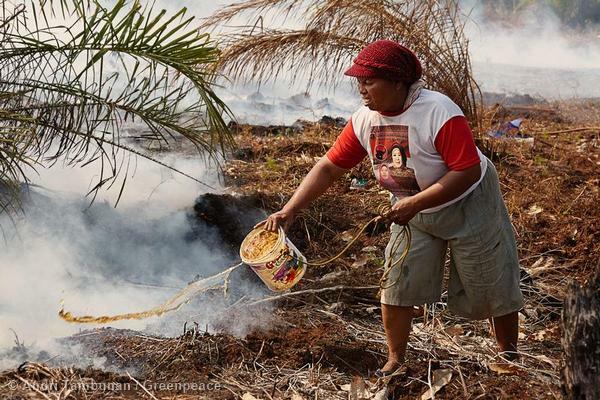 Over 75% of Indonesian fire hotspots, or the places where wildfires burn most intensely, occur on peatland. A villager tries to douse a smouldering peatland fire which burnt over 30 hectares of land at Selinsing Village, Riau. 4. Many peatland fires occur on protected lands. 30% of fire hotspots actually occur on land meant to be protected under the governments moratorium on forest clearance. This fire was on mapped peatland and tiger habitat and within an area that is covered by the Indonesian government’s moratorium on the issuance of new permits in primary forests and peatland. 5. International impacts. In 1997, an extended drought fuelled the most intense forest fires to date, spewing air pollution as far as Singapore. Described as a carbon bomb, these fires pumpedas much carbon dioxide into the atmosphere as the United States released that whole year. 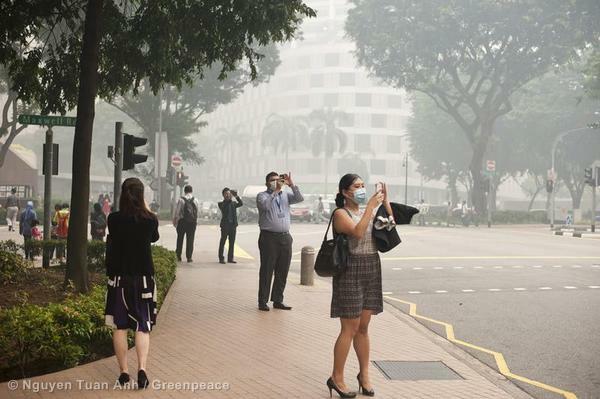 Singapore haze caused by Indonesian fires is a regular occurrence. 6. Peatlands are vital habitat. 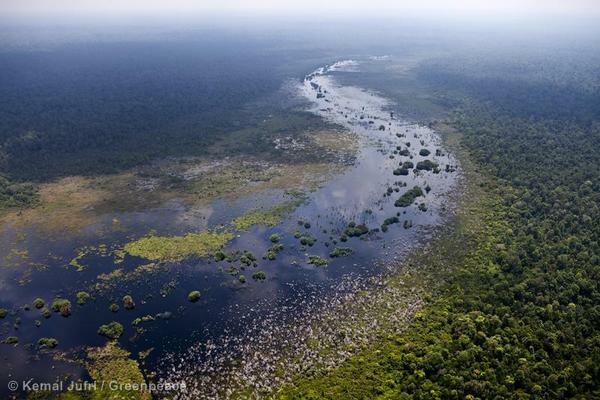 Peatlands are also habitats for endangered species like orangutans and tigers. Their destruction puts at risk the survival of numerous freshwater fish. 7. One place bears the brunt. 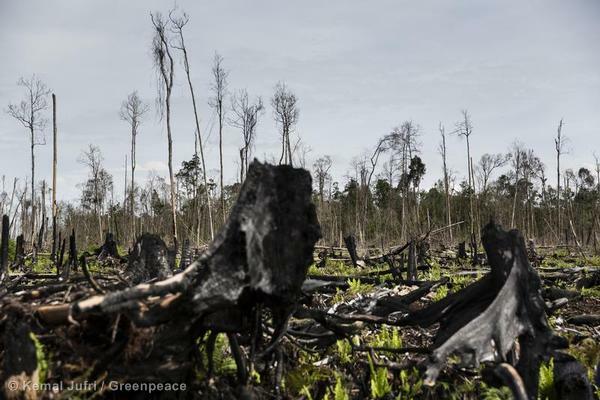 Riau, in Sumatra, is ground zero for forest and peatland destruction. It is the center of the countrys palm oil and pulp and paper industry. 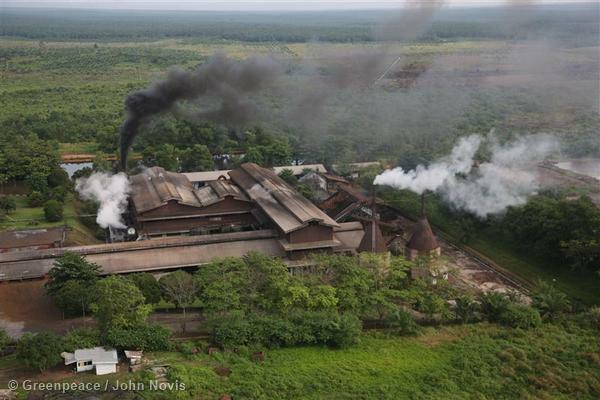 Its also where 75% of peat fires take place. Palm oil industry facilities in Riau. 8. Loss of flood control. Peatlands act as giant sponges, soaking up water and helping to mitigate flooding. During the dry season, peat releases water slowly and can be a source of fresh water for surrounding communities. Members of the Teluk Meranti community together with NGO’S Greenpeace, Jikalahari and Yayasan Mitra Insani, use sand bags to build a dam to block the drainage of peatlands. 9. Planting on peatland is input intensive. it is often more costly to establish plantations on peatlands than on other soil types. Peatland plantations have higher pest and weed infestation rates, roadbuilding is more expensive, and additional fertilizer inputs are needed. 10. 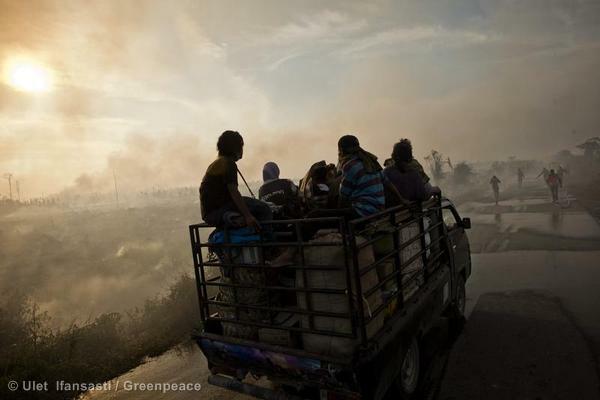 The people.Forest fires have long lasting impacts on the livelihoods of thousands of Indonesians. 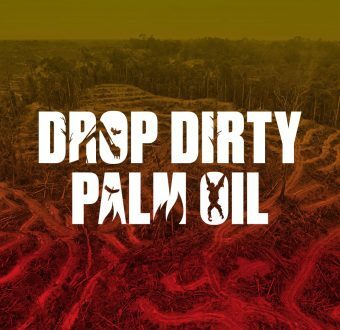 Last year, Greenpeace was one of the first NGOs to call out palm oil companies for their role in peatland fires. The Haze Wave sent pollution levels in Singapore skyrocketing, sparking frenzied buying of facemasks and a flurry of meetings between regional governments. This year it could get worse. Weather patterns are colluding to make this year’s drought particularly strong. Also, more peat and forest has been cleared than ever before. It’s giant tinderbox. 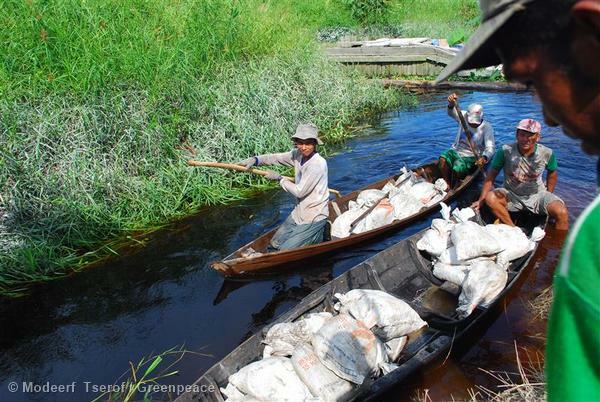 In the last 12 months, Greenpeace supporters have pushed companies like Procter & Gamble, Colgate-Palmolive, and forest-resource giants like Asia Pulp & Paper to end their role in forest destruction. Theres momentum. Thats why this year we need to come together and demand that outgoing President Susilo Bambang Yudhoyono firms up his green legacy. Share this story of the families living through the forest fires. And take action here. For more information and references, you can check our briefing,Sumatra:Going up in smoke.